Hello, Tomato Lovers! 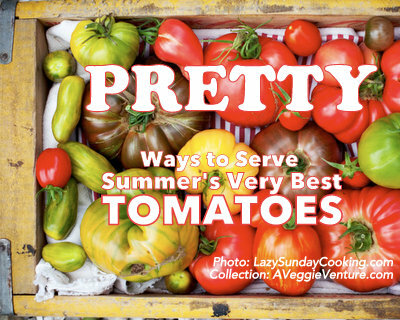 Here's just what you've been looking for, a collection of tips and photos, all the prettiest ways to serve sweet, juicy summer tomatoes. Who else is as excited as all get-out that it is tomato season?! We seasonal eaters, we wait all year long for this moment. A whole two tomato seasons ago now, I got this idea to collect pretty ways to serve the summer's best tomatoes. No cooking, no grilling, no roasting, just good tomatoes straight from the garden served in beautiful but simple ways. You'll see what inspired that idea, it's in the first photo below, a beautiful platter of tomato slices sprinkled with dainty white garlic chive flowers with a tiny tomato bouquet of flowers in the center. Yeah, I know, sooo simple and yet so pretty. I found so-so many ideas but pared them down to just fourteen, all from talented tomato-lovin' food bloggers. And as I studied the photos, trying really hard not to drool tomato juice, I realized that serving tomatoes in pretty ways, well, the ideas hold much in common. 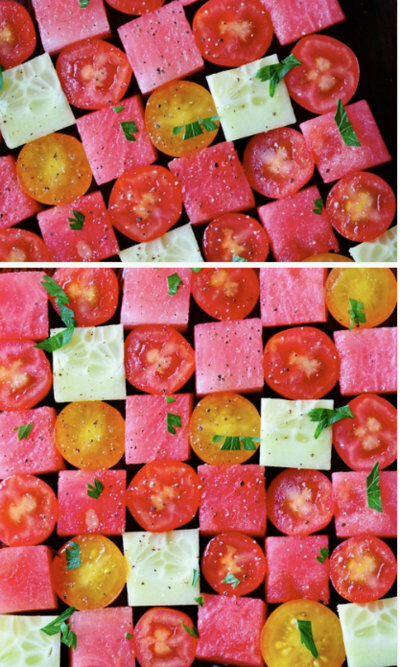 THINK COLOR For a rainbow of tomatoes, choose the abandon of leaf-, lemon-, tangerine-, plum- and wine-colors of heirloom tomatoes – or the opposite, the soothing plainness of a single color of tomatoes arranged in simple fashion. THINK ARCHITECTURE So many pretty ways with tomatoes are "architectural". You know, stacks or overlapping layers or concentric circles or cute little skewers. I love their symmetry and repetition. But on the other end of the spectrum? 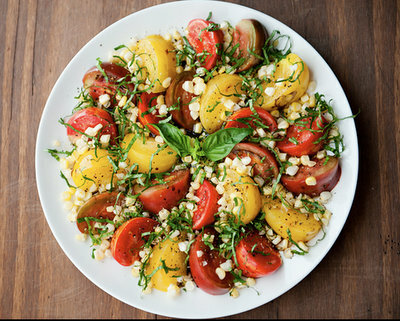 A big jumble of pretty tomatoes can be really, really pretty too! THINK RIPENESS Most important of all? One blogger after another mentioned how important this is, it's really key to produce a tomato dish that tastes as good as it looks. You know this, right? The tomatoes should be perfectly ripe as if just-plucked warm from the summer sun. Repeat this three times! These recipes are not for January! Well, unless you're in the southern hemisphere. THINK "NO RECIPES" The recipes I've selected, well, they're not really recipes, per se. With one quick glance, you'll get the idea and know to start digging into a cupboard for a long-unused platter, to wonder whether the garlic chives are in blossom. MANY THANKS Finally, let me officially thank Lazy Sunday Cooking, a lovely lifestyle blog in Poland written in English by professional photographer Marta Potoczek. Marta graciously answered "yes" when I asked permission to use her beautiful photo of a box of home-grown heirloom tomatoes. Marta's photo is featured in her tip-filled post called Growing Tomatoes, a must-read for anyone who's growing tomatoes. Thanks so much, Marta! Follow her inspiring work on Facebook, Pinterest, Instagram and Flickr. 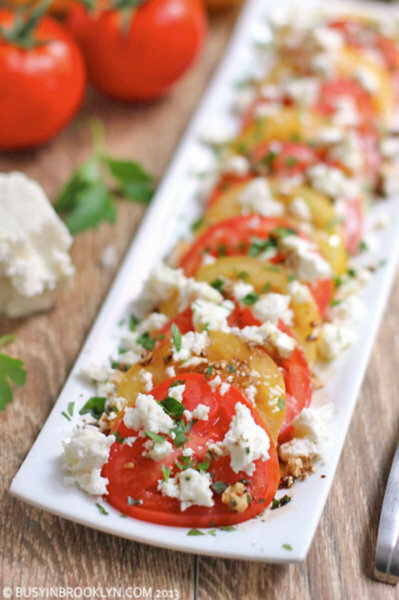 Looking for tomato recipes, not this collection of tomatoes served in especially pretty ways? Here are all my tomato recipes and twelve favorites! 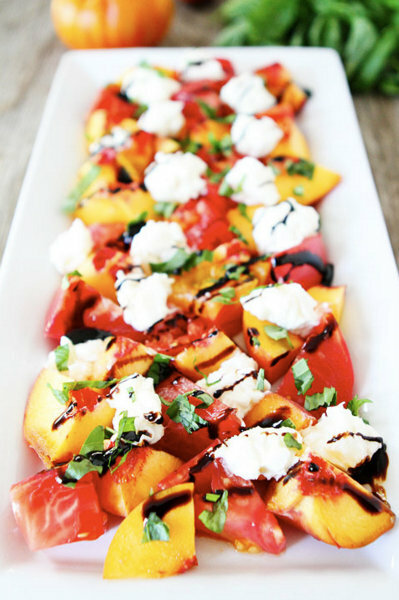 What's your favorite pretty way to serve perfect summer tomatoes? Friends brought this beautiful plate of tomato slices to a potluck, it's the inspiration for my search and discovery of the many ways to to serve tomatoes in pretty ways. There's no recipe, per se, the flowers of garlic chive are so pretty during tomato season. So pretty, this plate! But tomatoes needn't always be sliced. Here, tomato wedges give great surface area to soak up the olive oil and vinegar. Note the platter's sloping sides, we don't want to lose those tomato juices! No question, stacked tomato slices can be ever so dramatic! 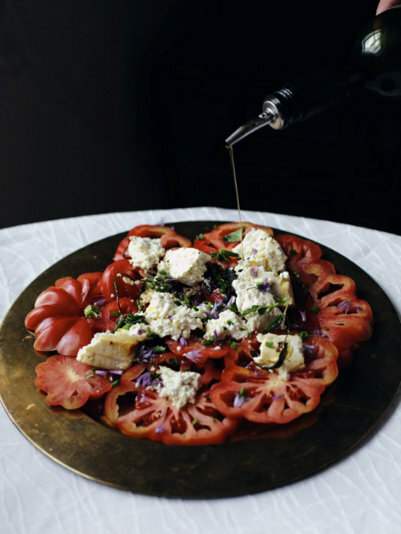 What's classic about Italian caprese [pronounced ka-PREE-zay] salads is the three simple ingredients: tomatoes, fresh mozzarella and basil. After that? You rarely see the same presentation twice! 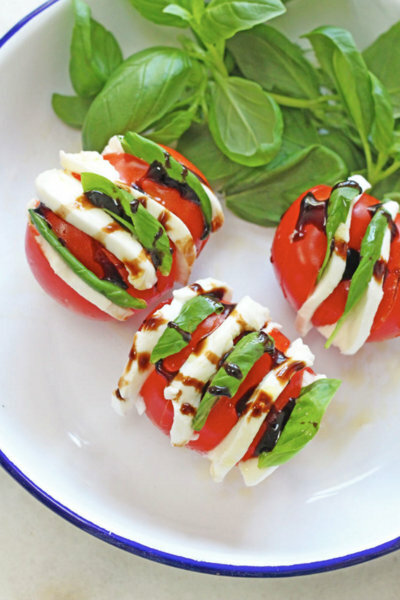 Personally, I'm smitten with the simplicity of basil leaves tucked between slices of tomato and fresh mozzarella, perfect for a weeknight supper or a simple salad for one or two. 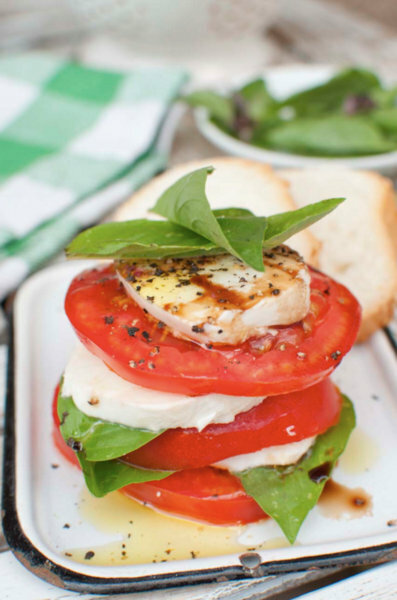 But turn those caprese stacks on their side to put a Swedish spin on the classic Italian salad. Just lovely! 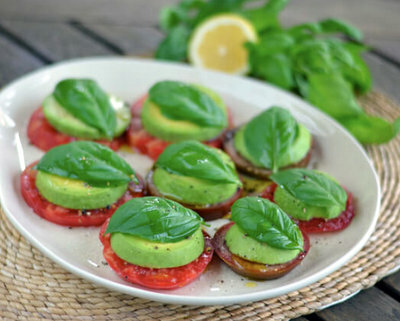 For a paleo take on caprese salad, omit the dairy-based fresh mozzarella and substitute with rounds of avocado. So pretty! 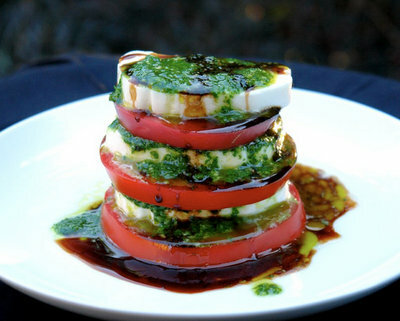 For a crowd, though, those dramatic stacks of tomato are just too fussy. Here I broke out my mother's trifle bowl. It's so pretty, such a show-stopper. Just slice and serve, that's it! Cute food sells! 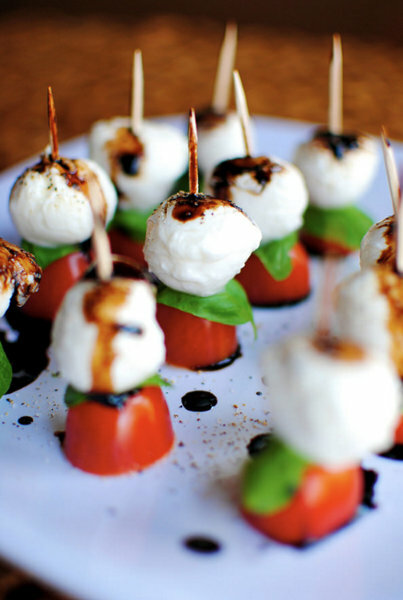 And it's so handy for buffets and parties, just quick no-fork-required appetizers. 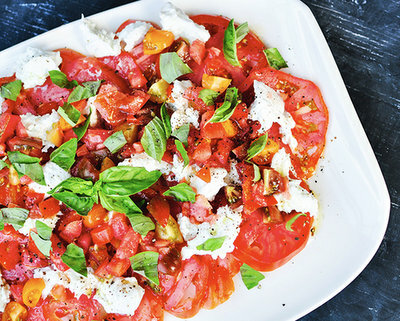 Creamy fresh mozzarella and burrata take all the glory with summer tomatoes but taste-wise and budget-wise and yes, "tang-wise", feta is a great summer choice. Be still, my beating heart. W-A-R-M feta. I love how a long rectangle platter shows off the shape of these pretty red and yellow tomato slices. Tomatoes and fruit? That doesn't seem quite so strange when you remember that tomatoes, too, are fruit. Remember that? First up, tomatoes and peaches. And finally, tomatoes with watermelon. Simply stunning! I hope you're feeling inspired to paint plates and platters with summer's best tomatoes, you know, "pretty tomatoes"! Does one pretty way especially suit your style? Are you jazzed to build a pretty plate in your very own pretty way? Great (and pretty) tomatoes! When I was growing up on our Midwestern farm, as soon as the tomatoes and cucumbers started to ripen, they were served at both dinner and supper meals. Mom did the same thing her mom and mother-in-law did - serve up peeled, sliced tomatoes on a big platter. Often these would be accompanied by pickle-like slabs of fresh-from-the-garden cucumbers, either on the same platter or in a separate dish. Tomatoes were eaten simply as a fresh vegetable. My grandma always set the table with small bowls for the tomatoes. Salt and pepper would be available or the sugar bowl, for those that liked to sweeten their tomato slices. Thanks for sharing these interesting recipes!